The Patent Pending Design of the Plane Perfect Golf Machine is extremely versatile and will adjust to fit all swing types and teaching styles. All adjustments can be made in seconds and once you choose the setup that is perfect for you, practicing your perfect swing with or without hitting balls will make you a more consistent golfer in a very short time. 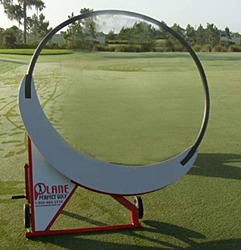 Plane Perfect golf is proud to announce its latest innovative product. "The Pro Model" it provides the Instructor or user the same versatility and ease of use as its predecessor (The Academy Model). The PRO MODEL is usually the choice for the avid golfer to a Touring Pro trying to improve their swing or for a driving range or instructor wanting to save money versus the price of the Academy Model and still have the most effective golf training system available. It is a perfect choice to put in the garage or in your own yard to practice daily or whenever it is convenient. Now is the time to join the golf instructional revolution and receive the results you deserve. Using your own clubs (steel shafts suggested) the patent pending design of the flat rear guide sets your club to the correct lie angle for each club selected, giving you a correct address position. The flat rear guide keeps the club on the correct path during back swing eliminating a too inside or too outside back swing. The flat rear guide also keeps the club on the plane that was selected for each golfer( flat to any degree of upright). If you have any questions regarding the The Plane Perfect Golf Machine Pro Model, please give us a call, we would be happy to help you with any questions you may have. Write an online review on the The Plane Perfect Golf Machine Pro Model, and share your thoughts with others.